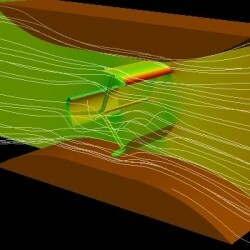 Menatech Limited presents an innovation-simulation-realisation showcase of an advanced Computational Fluid Dynamics (CFD) simulation of a Darrieus River Turbine. The animation shows velocities and pressure in a typical river configuration. Please check our You Tube page for a video of the simulation.